LEBANON, Ohio – August 8, 2014 – Three of Doran Racing’s four drivers finished on the podium in Continental Tire SportsCar Challenge races at Road America in 2012 or 2013, and the Lebanon, Ohio-based team hopes they can do it again on Saturday when the series makes its annual visit to the beautiful 4.048-mile, 14-turn road course in Elkhart Lake, Wis.
Brad Jaeger of Charlottesville, Va. hasn’t competed at Road American since 2006, but his co-driver, B.J. Zacharias of Cincinnati, and Bryan Heitkotter of Fresno, Calif. finished third at Road America last August in the Doran Racing Nissan NISMO 370Z #14. The entry led almost half of last year’s race, as it was in first place 23 laps out of 53. Both Heitkotter and Zacharias were among the six drivers who led. Last year the Doran Racing Nissan was clearly the fastest car in the race too. Heitkotter won the pole in the car with a time of 2:22.295 (102.413 miles per hour), and he also set the fastest lap of the race with an even faster 2:21.641 (102.885 mph) on lap six. The drivers of the team’s other Nissan entered in this year’s race — Toronto-based John Farano and David Empringham — have been on the podium here recently too. 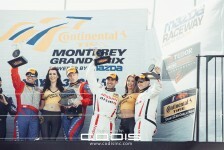 They finished third at Road America in 2012 in a BGM Motorsports Porsche enroute to winning the 2012 championship. They certainly know their way around the course, and they’d like nothing more than to climb onto the podium after a great race on Saturday with their Tower Events Nissan 370Z #41. Both cars were in the top 10 at the most recent race. The #14 finished fourth and the #41 was a solid eighth July 25 at the Indianapolis Motor Speedway, so the team definitely has momentum on its side. Preparation for Road America has been challenging, however. The Nissan 370Z RC #14 that Zacharias and Jaeger usually drive was badly damaged in a crash during qualifying last Saturday morning at the Mid-Ohio Sports Car Course in its first foray into the Pirelli World Challenge series. Zacharias was behind the wheel and luckily he wasn’t hurt, but the accident generated a change in plans for the team. Plan “B” required long hours to quickly finish the repairs needed on the #41 Nissan that was involved in an opening-lap crash at Watkins Glen, N.Y. on June 28 with Farano behind the wheel. Thanks to the crew’s hard work, Zacharias and Jaeger will drive that car this weekend at Road America, relabeled as their usual #14. Jaeger is fourth and Zacharias is tied for fifth in the Grand Sport driver standings going into this weekend, while Empringham and Farano are tied for 26th. The #14 is fifth in the Grand Sport team point standings and the #41 is 19th with four of 14 events remaining this season. At press time 23 Grand Sport cars and 31 Street Tuner cars are entered at Road America. The on-track action begins at 9:40 a.m. Friday with a 45-minute practice session. A second 45-minute practice session follows at 12:50 p.m. The 15-minute Grand Sport qualifying session is slated for 4:35 p.m. the same afternoon. Saturday’s 2.5-hour race is scheduled to get the green flag at 1:15 p.m. The race will be carried live on imsa.com beginning at 12:15 p.m., and on a tape-delayed basis at noon Eastern Sunday, Aug. 17 on Fox Sports 1. 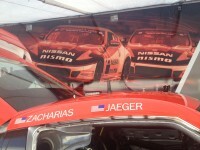 Brad Jaeger: “Based on last year’s performance, the Nissan 370Z should be really strong at Road America. “The last time I raced at Road America was in 2006, but I’m really looking forward to returning. It’s one of America’s best tracks and one that I’ve always enjoyed racing at. B.J. 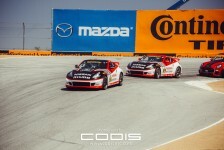 Zacharias: “I’m really looking forward to Road America. We have had a quick car there the last couple years, and in 2013 we were one lap short from stealing a win. “After the unfortunate event last week at Mid-Ohio, this crew has once again been asked to work miracles and sacrifice one for the team. They have completely rebuilt the original #41 car in three long days and three long nights as the new #14 car. “I’m looking forward to the opportunity, and it would be great to hand these guys some sort of feeling of accomplishment for what they have been asked to do. “Road America is probably my second home track to Mid-Ohio because of my many years running SCCA up there. My first national SCCA win came there, so it would mean a lot to do well.